Sheesh. So, why did Eric Arthur Blair (a.k.a. 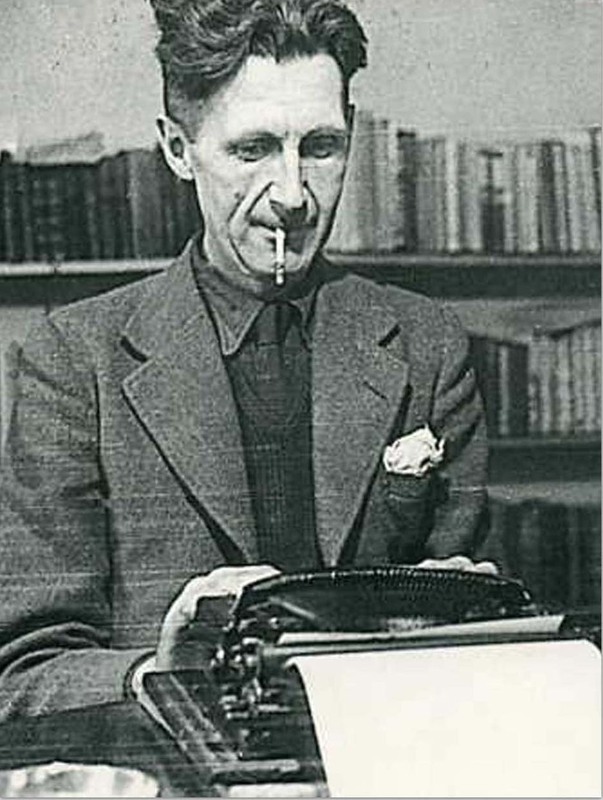 Orwell) write? I suppose I relate most to the first two. Sheer Egoism? Sure. I find writing both ego-stroking and soothing. Aesthetic Enthusiasm? Absolutely. Arriving at le mot juste — or the right combination of mots — is liberating and satisfying. And as for the last two? Well, I want to contribute good novels for smart, young readers, but my ego hasn’t been stroked quite enough to feel like I’m participating in the grand Historical Impulse. And while I try to pepper my middle grade and young adult novels with ideas about socio-economic structures, I can’t really say that I’m driven by Political Purpose. Orwell has lots of weighty, important things to say about these four great motives. (You can read the complete essay here). This particular demon has only recently come to stay with me. There I was, minding my own business — trying very, very hard to mind my own business: Raising two daughters, doing some freelance writing, teaching a few classes, and struggling to finish my Ph.D. I had plenty of business to mind. But then a little demon flew into my head. An idea for a novel. And it wouldn’t leave me alone. My attention was pulled more and more toward character names, plot ideas, turns of phrases. The opening sentence. Oh, I adored thinking about that opening sentence. The whole thing became a fantasy land to which my mind flew. But, of course, I did it. I opened up that document and started writing my very first piece of fiction. Well, my first piece of fiction as an adult. It wasn’t that way for me, although I did write a fair bit as a kid: mostly poetry and short stories, including a very, very earnest story called, “Friends Forever.” I wasn’t exactly a prodigy. But I did enjoy making things up and writing them down in my loopy, girly script. And then, as I grew up, I drifted away from fiction. I became an academic and then a freelance art critic, and I wrote a fair bit of non-fiction. I still do, and I love that process. No. I am grateful for that process. Through the cherry-picking of words that will articulate what I want to say, I figure out what I am saying. It’s how I understand art and history and theories more deeply. But fiction is different. It takes me places I didn’t even know I could imagine. Writing fiction is magical. Sometimes, I am almost breathless when I write, and that’s not an exaggeration. I want to find out what happens next. Of course other times — often, really — it’s plodding and sticky. But when it’s flowing, and I’m in it, really in the writing, it’s as close to alchemy as I’m ever going to get. The characters talk to each other. The next element in the plot is revealed. Or, all of a sudden, something insists on being inserted into an earlier chapter. I rewrite as I write. I understand as I go. And I keep going until I’ve created something out of nothing. So, now, this alchemical escapism has become its own demon. A friendly, if slightly nagging, demon that I have welcomed into my life, onto my couch where I sit with my laptop, wondering where the writing will take me.